When the colonists arrived on the shores of America, among the kitchen and medicinal herbs that crossed the ocean with them were chives. Down through thousands of years, chives have been cultivated and developed. As long ago as 3,000 B.C., onion chives (Allium schoenoprasum) were found growing in the gardens of China. The great Emperor Charlemagne, in A.D. 812, listed the already familiar chives among the more than seventy other herbs in his famous garden. Dodoens gives the French name for it in his days: “Petit poureau,” relating to its rush-like appearance. In present day it’s common French name is “Ail civitte”. The Latin name of this species means “Rush-leek”. The well-known herbalist of England’s sixteenth century, Parkinson, also cultivated this familiar herb. Chives are the smallest, though one of the finest-flavored of the onion tribe and belongs to the botanical group of plants listed as Alliums. The variety, A. Schoenoprasum “Ruby Gem”, has gray foliage and pink-ruby flowers. Allium schoenoprasum “Forcaste” grows slightly larger than the usual chives. Another important allium species in China and Japan is the Welsh onion which provides a continuous supply of bunching onions and leaves throughout the year. Though said to be a native of Britain, Allium schoenoprasum can be found growing throughout temperate and northern Europe but rarely is it found in an uncultivated state. In the Southern gardens of the U.S., this hardy perennial is frequently seen delicately edging a garden bed because it makes such an attractive border plant. The Chive contains a pungent volatile oil, rich in sulphur, which is present in all the onion tribe. Although herbalists of old did not find much medicinal use for chives, it was believed that chives could drive away diseases and evil influences; bunches of them were hung in homes for this purpose. But modern research has found sulfur oil is antiseptic and helps lower blood pressure, but only in fairly large quantities. Chives can be called a healthful rather than medicinal herbs. They are useful in toning the stomach, reducing high blood pressure, and strengthening the kidneys. Chives also are rich in calcium which strengthens nails and teeth. 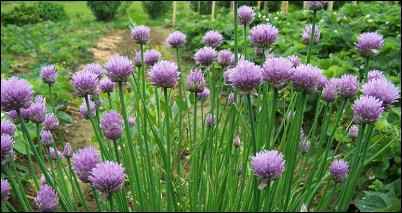 Chives stimulate the appetite and tone up the kidneys. The delicate piquancy that they impart to food makes chives best known for their use in cooking; they taste like mild, sweet onions. Mince the fresh leaves to flavor dishes and don’t overlook the flowers. Toss them in salads or garnish dishes with them. This plant is a hardy perennial. The tightly crowded bulblets grow in clumps very close together in dense clusters. The hollow, round reed-like spears of leaves appear early in spring and are long, cylindrical and hollow, tapering to a point. They grow from eight to twenty inches tall, though they rarely reach over a foot in gardens. The leaves should be harvested before flowering, usually about four to six weeks after the growing season begins. The flowering stem is hollow and either has no leaf, or one leaf sheathing it below the middle. The mauve pin-cushion blossoms consists of numerous flowers encased in paper-like bracts and densely packed together on separate, slender flower-stalks. The flowers are in blossom in June and July. With consistent watering, the blooming period can be lengthened. Keep free of weeds—once grasses become established in a clump of chives, they are difficult to eradicate. Chives will grow in any ordinary garden soil. They are nitrogen-loving plants and thrive in rich, well-draining soil with regular applications of fertilizer. Chives can be raised from seed, but are usually propagated by division of clumps in spring or autumn. In dividing the clumps, leave about six little bulbs together. These will spread to a fine clump in the course of a year. Set the clumps from nine inches to a foot apart each way. This division of mature plants is beneficial for because chives multiply quickly and need to be divided every three or four years. Plant two to three-inch sized clumps about a foot apart. Onion chives will die back during the hot summers, but begin to show tender new shoots when cooler temperatures return. They also go into hibernation for the winter. You may want to pot up a clump in the fall and bring it into the house to have a steady supply of this mild onion flavor all winter long. Plants will live several years in pots. Chives grow slowly from seed and take nearly a year to reach maturity. Needs moderately rich, well-draining soil and full sun. Chives are hardy to zone 3. Flowers of onion chive are small and pale-purple in color. They form a dense globular umbel at the top of a stem. Leaves are dark green, slender and hollow. Plants can grow to a height of eighteen inches. Garlic chive flower-heads are composed of densely packed white blossoms that form a rounded shape. A perennial, chive bulbs are dormant over winter but new green shoots appear early in the spring. Garlic chives remain green year-round. Give onion chives a “haircut” about twice a month from May to frost. Discouraging chives from blooming by pinching off the flower stalks will promote the growth of new leaves. A less familiar variety of chives (Allium tuberosum) is commonly known as Oriental garlic or Chinese chives. Easily distinguished by its garlic aroma and taste, this herb also grows in clumps like onion chives, but has lighter green flat reed-like leaves. Garlic chives are taller, reaching up to two feet, and produce delicate clusters of starry white flowers which bloom in late summer, lasting well into fall. Full sun is preferred but they can tolerate some shade. This hardy perennial can be cut back frequently to promote thick growth. Garlic chives are prolific self-seeders and can become invasive if not controlled. Both chives grow easily, but slowly, from tiny, black seeds; the garlic chive seed are twice as large as the onion chive seed. Both chives will reseed themselves if allowed. Garlic chives are often used as an ornamental border because they remain green all year. These flowers attract bees and bumblebees galore when their charming white flower-heads are blooming in the herb garden. You might want to consider allowing some of the flowers to completely dry on the plant. Then, when the petals are paper-dry, harvest them to use in dried arrangements or within an herbal wreath. It is best to use these herbs in their fresh state as the flavor and nutrition is diminished by cooking. Remember to wait until the last few minutes of cooking to stir in these herbs; long cooking destroys the delicate flavor. 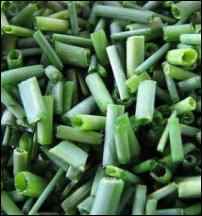 Being a coarser plant, garlic chives should be chopped more finely than the onion chives before adding to dishes. Garlic chive blooms are edible; the flowers have a mild, sweet aroma and a pleasant flavor. They can be tossed into salads, add them to stir-fries at the last minute, or add them to sauteed or steamed vegetables or baked potatoes. Use to garnish herb butters or sauces and to garnish plates. Garlic chives should be chopped very finely before using them. 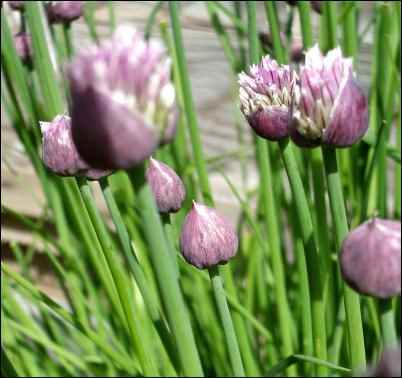 The mauve pin-cushion blossoms of onion chives are also used to flavor vinegar; the finished product ends up a lovely rosy hue. Although both onion and garlic chives produce small bulbs below ground, it is the leaves that are used in the kitchen. Use onion chives whenever a mild onion flavor is desired. This herb contains phosphorus, iron, Vitamins A and C, and pectin. It has a reputation of stimulating the appetite and toning up kidneys. It also contains calcium which strengthens nails and teeth. Onion chives complement cheese, soups, salads, egg dishes, dips, spreads and any food you would use onion with. The tasty new leaves of garlic chives have antibiotic properties; the sulfur oil in these strap-like blue-green leaves is antiseptic and helps lower blood pressure. Chives may be planted as border around the vegetable garden. Chives are a crucial ingredient in fines herbes and bouquet garni. Adding blossoms of onion chives creates a flavorful and rosy-colored herb vinegar. Garlic chives have a robust flavor and should be used sparingly. Romanian gypsies are said to have used chives in their fortune telling rites. Chives fare well grown as a potted plant indoors. Home-dried chives soon lose their color and the flavor turns salty over time, but they can be successfully frozen. Chop them and freeze in small packet. If frozen for future use, chopped chives do not have to be thawed before use. The best and most nutritious way to use them though, is fresh. You may want to try drying chives leaves in a cool oven with sea salt and crush to store as chive salt. In the garden, these herbs can become aphid traps for your carrots and roses is planted nearby. Chives also have a reputation of deterring Japanese beetles and black spot on roses. Farmers who garden with organic methods sometimes prepare a natural insecticide by grinding garlic, chives and chili with water to use as a spray. Harvest your chives frequently by pinching off stems from the outside of the plant’s base – cutting with clippers or scissors will cause the stems to turn brown. Allow new shoots to mature from the center of the clump. Whatever your reason for growing chives, onion and/or garlic, you can be sure this flavorsome herb family will prove its worth in the garden and in the home.